Nominations are invited for the following categories. 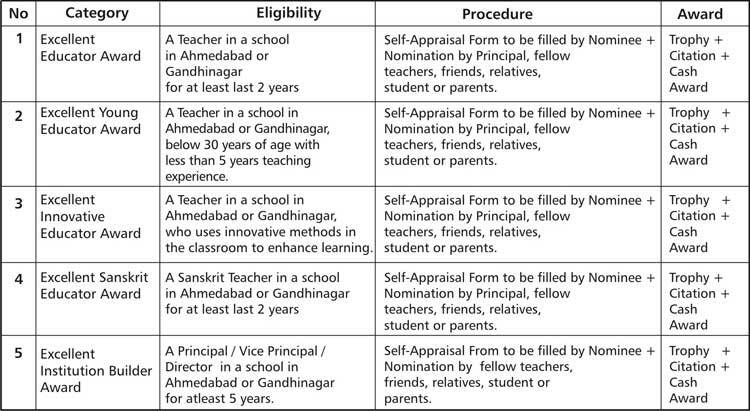 NOMINATION PROCESS: Nominations may be made by principals, fellow teachers, friends, relatives, students, well wishers (like parents of students) or even the teacher her / him self. Feedback will be taken from the principal and a few fellow teachers and students as part of the selection and shortlisting process. Nominees may be called for personal interviews or their classes may be visited for the purpose. The findings of these meetings are presented to the jury who will decide the winners. The winners are awarded a cash prize, a trophy and a citation on Teachers’ Day on September 5th each year. For nomination forms and details please contact Anand Padh on 079 - 2646 1629 at our office.